ATTRACTIONS & EVENTS A popular stop on the town's mainstreet is the Sedgewick Archives and Museum – a provincial historic site, built in 1906 as a former merchant bank (see also page 21). Sedgewick Community Hall hosts monthly community events including Flagstaff Players performances, and hosts the July 1st Canada Day breakfast. The Sedgewick Seniors Centre is conveniently located on Main Street with continuous event planning such as cards, floor curling, and regular meet-ups. Sedgewick Public Library is within the Sedgewick Recreation Centre which facilitates bowling, curling, hockey, lacrosse, public skating, shinny, baseball, football and private events. The Sedgewick Ag Society hosts an array of sporting events including a Cutter Rally, Snowmobile/Quad rally in February, Chuckwagon Races from June 28-July 1 and the annual Rough Stock Rodeo in August. Meanwhile, the Sedgewick Golf Course holds tournaments in July, August and September. 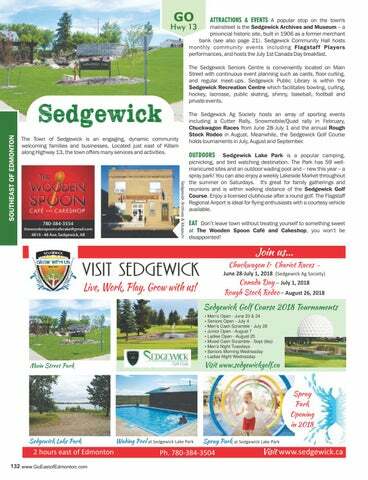 The Town of Sedgewick is an engaging, dynamic community welcoming families and businesses. Located just east of Killam along Highway 13, the town offers many services and activities. OUTDOORS Sedgewick Lake Park is a popular camping, picnicking, and bird watching destination. The Park has 59 wellmanicured sites and an outdoor wading pool and – new this year – a spray park! You can also enjoy a weekly Lakeside Market throughout the summer on Saturdays. It's great for family gatherings and reunions and is within walking distance of the Sedgewick Golf Course. Enjoy a licensed clubhouse after a round golf. The Flagstaff Regional Airport is ideal for flying enthusiasts with a courtesy vehicle available. EAT Don’t leave town without treating yourself to something sweet at The Wooden Spoon Café and Cakeshop, you won’t be disappointed!